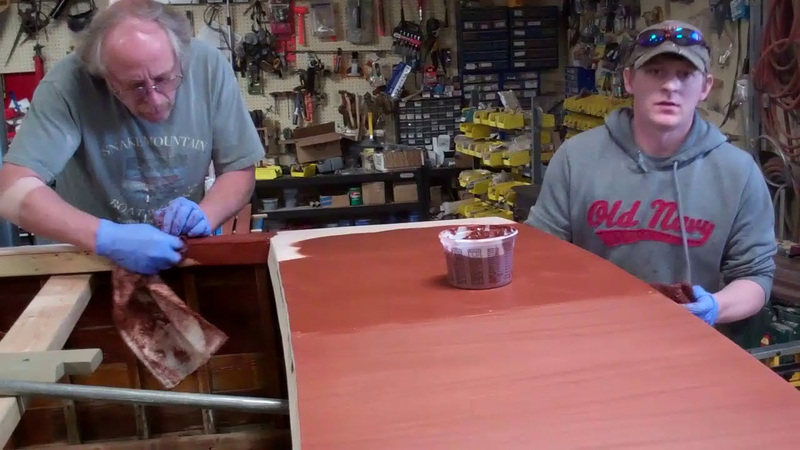 Here is Part II of the crew blasting through the bleach-stain milestones as we apply Wood Kote Products Jel’d Wood Stain on our 1957 23-foot Old Style Lyman Runabout. Part I’s narrative focused on the how, why and advantages of jel’d over filler stain in these applications. Yes, it is far easier to apply and delivers an incredibly uniform color. It, goes an incredibly long way; we used about 12 ounces to stain everything we stained today. But it is not a filler stain, which translates into a surface that retains most of its cross-sectional declivities – hills and valleys – post staining, especially compared to a filler stain, which is designed, well, to fill these selfsame valleys. Bottom line even following three full coats of Clear Penetrating Epoxy Sealer, filling these valleys and thereby achieving the truly flat surface we thirst for requires at least 3-5 additional coats of varnish. We are not ready to jettison our Interlux Interstain Wood Filler Stain yet, but the ease with which we achieved an absolutely uniform color across all these surfaces makes it truly difficult to hide the Wood Kote in a deep corner of a dark cabinet! Next PostNext 1959 Chris Craft 17′ Sportsman Engine Install Alignment is Cricital!! !